THANK YOU for visiting Garage Experts of The Grand Strand. Local owners, Michael and Shaleen Albin, live in the Myrtle Beach area with their little boy, Jakob. Michael is a Navy Veteran who proudly served his country. He recently retired from the installation business where he has over a decade of experience. Shaleen is a local, who grew up in the Grand Strand area, and has resided here for over 35 years. Together, they are devoted to designing custom solutions to provide you with the ultimate home makeover experience within your specific budget. Michael and Shaleen are dedicated to integrity, excellence, design and efficiency. 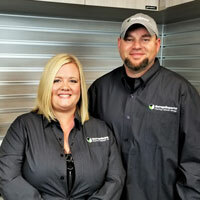 Garage Experts is nationally known, and locally owned. We have a very strong work ethic and offer world class customer service to ensure that your storage and floor coating installations will greatly exceed your expectations. With our exclusive Garage FX patented epoxy floor coatings, partnered with our superior custom storage cabinets, your garage will become your new favorite room! When you choose Garage Experts to install your residential or commercial floor coatings and custom storage cabinets, you are supporting a local small business in our community. Because you are dealing directly with the local owners you can rest assured your satisfaction is our number one priority. We sincerely thank you for your interest. Call us for your FREE estimate. 843-594-0005. We proudly serve the Grand Strand area and many more locations in the eastern part of the Carolinas. We look forward to assisting you make your vision a reality. Calabash, Carolina Shores, Cherry Grove, Garden City, Georgetown, Longs, Murrells Inlet, Myrtle Beach, North Myrtle Beach, Ocean Isle, Pawleys Island, Shallotte, Sunset Beach, Surfside, and other locations along the eastern shores of the Carolinas. GarageExperts of Grand Strand is your local garage makeover expert. View some of our recent work.